Struggling to find the right tone? Wanting to dazzle your friends with a brilliant speech? 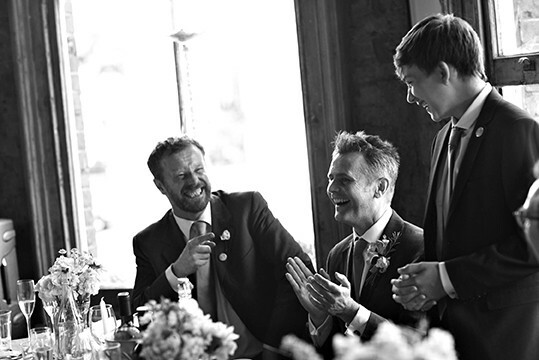 Wedding Speech Guru is a coaching service for anyone making a wedding speech. Wherever you are in the speech writing process, we can help. Are you staring at a blank sheet of paper, unsure how to begin? We will give you a structure and enable you to gather your material. Are you nervous about speaking in public? We will help you overcome your fears and connect with your audience. Do you require an editor to assess and develop a speech you have already started? We will help you establish the narrative, tone and flow. Do you need to practise and perfect your delivery? We will make sure you command your audience’s attention and speak with confidence and composure. Core to our philosophy is the belief that every wedding is entirely unique, as is the person giving the speech… YOU. With my help you will develop and deliver a speech that only you could give, rich with humour, insight and affection. Everyone commented on what a wonderful speech it was. I think it was a lovely mixture of real heartfelt emotion with great splashes of humour. I can’t thank you enough for all your help. Thanks for all of your help. You are an outstanding writer. Throughout this process, I’ve learned a thing or two about writing and speaking that will go a long way towards helping me in the future. And it feels great to have given a successful speech! It really all worked out beautifully. Thanks for your help. The speech hit just the right mark, and it got some laughs, including from the bride! I had lots of people come up to me to say they liked it (comments such as ‘great’, ‘heartfelt’, ‘right tone’, ‘good pace and pauses’). My brother was really happy and I enjoyed it. Thank you again so much or all your help, it made all the difference! The speech turned out great – everyone was really impressed and some people even said it was the best wedding speech they had ever heard! Thanks so much for all of your help – I couldn’t have done it without you. Speech went amazingly. Everyone told me how good it was. Thanks for all your help! With Robin’s professional guidance I felt much more confident about giving the speech. If you are feeling nervous and are not used to public speaking, I would highly recommend giving him a call. The speech went very well. Thank you for all your help in putting it together – you were instrumental in bringing it to life! Thanks for all your help and advice. The speech we finished up with was 100 times better than what we started with. The stories were the same but the delivery was so much better thanks to you.